Renita D'Silva is a name I know although not one which has been attached to the front of any of the books I've read. Her previous two novels, Monsoon Memories and The Forgotten Daughter, have both appeared on my Amazon recommended lists and if I had slightly less to read I would likely have tried one or the other by now. Instead, I was pleasingly approved for the ARC of her new novel, The Stolen Girl, which you will be able to part with your money for from the 12th September. 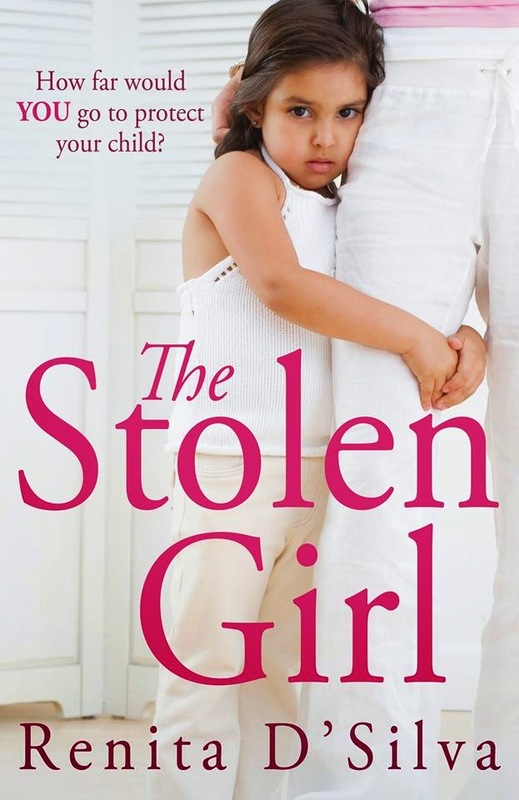 Despite the cover, The Stolen Girl of the story is 13-year-old Diya who one day has an argument with her mum, strops out, goes back for her coat and finds her mum being taken away by The Rozzers. According to the police, Diya isn't Diya, she's Rupa; and Vani isn't her mother, Vani is the woman who stole her as a baby. Diya's real mother, Aarti, is at a hotel nearby, waiting to take her daughter back to India. The book follows these three characters, Diya, struggling to adjust to this new truth, Vani, writing letters to her daughter from prison, and Aarti, desperate to finally meet the child she's been searching for all its life. It also attends to Vani and Aarti's pasts, to their childhoods and to the truth about Vani's actions. The trouble is, despite an introduction in which the author thanks various people for aiding her with research and which I'm confident she has done, it doesn't read like it. Although I'm a pedant, I don't mind minor changes to fact, especially when they improve the flow of the book - things like (as mentioned in the introduction as being incorrect) the number of visitors a prisoner can receive in a day: absolutely fine. However, The Stolen Girl is dependent on things happening in a way other than they would and that's a problem. A big one. You know that song by Natasha Beddingfield, These Words? You know the way you can't quite believe that nobody, at any point between the initial rehearsal right the way through to signing off the finished track said, 'Actually Natasha, it's pronounced Hy-per-bo-lee"? That is the level of error here - the kind of basic thing you'd imagine somebody, at some point between the author writing it and the file being sent to the printer, would have picked up on. Consider the incident in Ireland last October where the Garda removed two children from their Roma families because - thanks to some racial profiling - they believed they'd been abducted; or the case in Greece also at that time which had a different outcome. Because of this, even when things are correct, I was painfully aware that there is "technically correct" and there is "realistically likely to happen". The Stolen Girl came down far too heavily on the side of the former without reference to the things I'm thinking of. I also have some minor complaints about the book's own continuity - tiny details like Diya commenting she's already lost weight and her clothes are looser on her after only a few days, maybe a week. It's frustrating because I did really like a lot of this book. I'm not the biggest reader of women's fiction but I really engaged with this one - my mark of a four star read is that I'm eager to get back to reading it to find out what happens and this, despite those errors, did that. Vani and Aarti's story in particular, while veering a little close to soap-opera plotting for my taste - I liked. It's difficult to write characters who act as these do while keeping them believable, but D'Silva does a good job with the emotional side of the story. I can't personally recommend this one, but I will emphasise that if you don't care about things being realistic, and/or you have no idea happens when you commit a crime, you probably shouldn't let this review put you off. Read the Kindle sample and if you don't spot any problems you'll likely be fine. There is a lot to like. However, for me, the problems matter. I'm struggling to decide if this book is actively terrible or just not very good. I want to mark this higher because I did enjoy reading it, but I have to show fidelity to my other reviews. With regret, 1.5 stars.